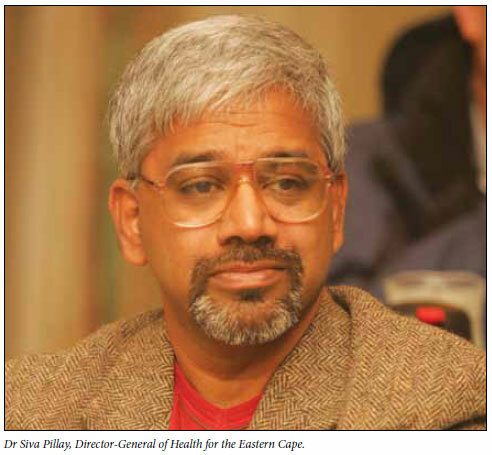 The Eastern Cape health department's corruption-busting director-general, Dr Siva Pillay, is an unabashed multimillionaire property developer who is using his considerable business clout to 'turn the department around' - not add to his fortune via 'jobs for pals'. That's his core rebuttal of allegations from among the swathe of former senior officials who have either been sacked or resigned (many facing charges of fraud and corruption) since he was appointed to South Africa's hottest provincial health seat in February last year. He has overseen the charging of more than 648 officials, from clerks to departmental heads, for various crooked practices. At last count, 297 had been dismissed or had resigned. With a passive income of R200 000 per month from his various business interests - all of which he swears he has fully disclosed to Parliament and his provincial cabinet (according to a copy of the Assets Register dated 16 June this year, he's worth R46.35 million), Pillay says he doesn't need the aggravation or the job. However, he's 'gritting his teeth', motivated by a desire to find the most practical and efficient ways possible to put a long-dysfunctional and thoroughly corrupt department to rights - and create efficient, sustainable health care delivery. The allegations against him began building a year ago, the cornerstone being that he appointed a business partner, architect and long-time friend, Edgardo Gamaleri, to work on a host of potentially lucrative hospital upgrades. Others were that he benefited from various procurement processes in preparation for the World Cup, failed to fully declare his interests and illegally awarded contracts to Gamaleri. Gamaleri, among other projects, was involved in the plans for the Cecilia Makiwane, St Elizabeth, St Patrick, Frontier and Madwaleni hospitals - all part of the department's flagship revitalisation of primary health care venture. He was also involved in St Lucy Hospital, Livingstone Hospital Oncology Centre, Frere Hospital Oncology Centre and All Saints Hospital. 'Absolutely right, he was involved with them,' says Pillay without hesitation, 'but as a salaried and newly appointed Director of Infrastructure and Planning (since December 2010), and not in any other capacity'. Confirming that he and Gamaleri were co-directors in five companies, Pillay said he took over a health department 'for which nobody (of quality) wanted to work'. Pillay says that since his election to Parliament in May 2009, he resigned as a director of all these companies. 'I told my previous MEC (Pumolo Masualle) that we'd have to head hunt and that I'd talk to some of my friends. The Minister had insisted in the National Health Council that all provincial departments should employ an engineer/architect to manage their infrastructure departments. All the provinces (except Western Cape) were struggling to attract suitably qualified candidates. They spoke to more than eight people to apply for the job. I divorced myself entirely from the process and said just choose the best person.' His MEC drew up a selection panel and Gamaleri emerged as the only applicant fitting the criteria (which included a minimum of 10 years' experience and an architectural degree). 'I fully declared our connection and history to them from the outset,' Pillay said. He has vowed to fight the allegations, now included in a re-opened provincial political probe being driven by his newly appointed MEC Sicelo Gqobana, to help benefit a department that he says needs his competence and connections to source people and build an effective team. Although disgruntled and wearied by the alleged improprieties (all of which he denies), Pillay is remarkably unfazed, describing himself as a philanthropist who even stood guarantee on several vital provincial health projects that would otherwise have collapsed. During the World Cup, when the health department was 'bankrupt', he called in pro bono favours from business associates and put up R50 million of his own to guarantee the April 2010 completion date of certain tournament-linked emergency health care facilities. The result was a FIFA award for the province with the best logistics, which included health. 'We simply didn't have the capacity. We owed the construction people R80 million and they were threatening to pull out. But my associates and friends helped out and never charged us a cent,' he said. When his department had to order much-needed ambulances (he fired the deputy head and all seven regional directors of this service and its chief resigned when it emerged they were doing booming business flying private patients in the helicopter ambulance and fixed wing rescue plane), he again stood as guarantor in advance of the new vehicle purchase. The extent of his disillusionment surfaced when Izindaba put it to him that in spite of his being cleared by a lengthy Price Waterhouse Coopers inquiry and a R1.8 million internal probe, his MEC had now ordered a re-opening of the investigation. 'The bottom line is that I'm getting quite fed-up. I thought I was going to fix a wheel, now it seems there's actually no wheel,' Pillay, a medical doctor, said. His efforts on the other three wheels of what is now an unexpectedly promising health care delivery vehicle remain impressive. They include reducing an infrastructure bill of R1.4 billion by more than R400 million and committing their entire health budget for the first time in 16 years. He claims that Gamaleri's management of the department has already saved the department more than R120 million. He also claims to have uncovered approximately R1 billion of fraud and corruption via comprehensive crimebusting operations, drawing on experts from National Treasury, Revenue Services, the SAPS (Hawks) and private auditing firms. E Cape Health headed for a historic qualified audit? He said of his budget: 'I've come from repeated adverse audit opinions - and disclaimer audit reports to a qualified audit opinion - with only two issues remaining on the table which need to be fixed. We now have a qualified audit for the first time.' Pillay also introduced a revenue retention policy for government hospitals (any profits from private patients used to go to National Treasury - now any figure in the black above R75 million is ploughed back into the provincial coffers). He said Gamaleri now did all the department's project planning, infrastructure management, and calls for proposals, adding: 'Before this we had no capacity to evaluate bids or bills of quantities'. Citing bid re-specification work done by Gamaleri's team on much-needed upgrading of Mdantasane's Cecilia Makiwane Hospital, he said the price had been reduced from R960 million to R840 million with a contractor finally appointed. (Criminal charges against staff from the 'previous' health regime involved in tenders are imminent.) At the newly built St Elizabeth's Hospital in Lusikisiki, the developers wanted R14 million after his department defaulted on payments. When the project was audited, Gamaleri and his staff found double payments and incorrect interest charged. The parties eventually settled at R4.4 million. 'Before this, we had no (staff) capacity to verify invoices and were perpetually paying interest as our people were deliberately paying late,' Pillay said. A review by Izindaba of forensic audits reveals that after Pillay's arrival the volume of disciplinary cases rose so steeply and the Employee Relations Unit was found to be so 'internally contaminated' that the department had to outsource the disciplinary work. Among the top officials sacked was his Chief Financial Officer, Mrs Phumla Vazi, who from 2007 built up a supply network of companies owned by her husband, daughter, and sister to which the department paid nearly R7 million. A 'starburst' chart shows each individual at the centre of multiple companies and the business connections between the various family members. The former General Manager, Infrastructure, Mr Malibongwe Mtuzula, left amid allegations that he took bribes from departmental suppliers via bank accounts held in the names of businesses where his girlfriend, a bank teller, was the common registered member. While still incumbent and in the face of a criminal probe, Mtuzula challenged the ending of his 3-year contract by Pillay, claiming it was for 5 years. He lost the case with costs. Asked whether he was still active in any of his own private businesses, Pillay said that 'technically' he no longer owned them. He explained that, having no children, he had restructured his affairs so that everything was part of a family trust. Upon his death, the family trust would be transformed into a charitable educational trust. 'There are a whole lot of charitable things that we currently do,' he added. Pillay, a professed Buddhist, has experienced death threats, a confrontation by an armed man who approached him in a deserted Bhisho car park and intimidating phone calls (including to his wife), since taking his new job.1 The latest incident was a break-in at his Uitenhage home at the beginning of July on a day he believes his opponents knew he was due to travel to Port Elizabeth. He cancelled at the last minute and armed response guards arrested two people, due to appear in court shortly. A spokesperson for the Eastern Cape Health Department, Sizwe Kupelo, said that except for a 'several months old' petition to cabinet by two former senior officials, to which Pillay had satisfactorily responded, he was 'unaware' of any new probes ordered by the MEC.